Boil water (or low sodium chicken broth). Rinse quinoa in a fine sieve and rinse under cold water for 1 minute. Add quinoa to water, bring back to boil, reduce heat, and cover. Cook for 15-20 minutes. Fluff when done. Put in a large bowl and allow to cool at least 5 minutes. Add spinach, tomatoes, and dressing. Gently toss ingredients together. Let sit for a few minutes before serving. If you have any leftover, this dish makes a great lunch for work or school the next day! 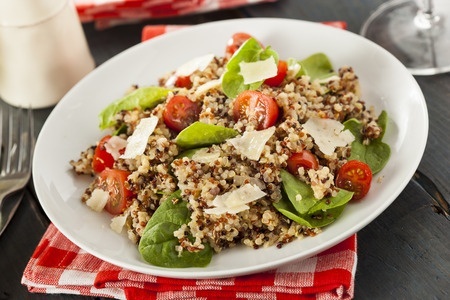 NOTE FROM NANCY: Quinoa is the only grain that is a complete protein, containing all 8 amino acids. It is easy to cook (remember to rinse it before cooking). Quinoa is very digestible, which makes it an ideal food for little kids and older adults. WELLNESS WEDNESDAYS: Are Your Kids Connected with Nature? © 2018 Growing Healthy Kids. Designed by Ocean Floor Web & Graphic Design Ministries, Inc.